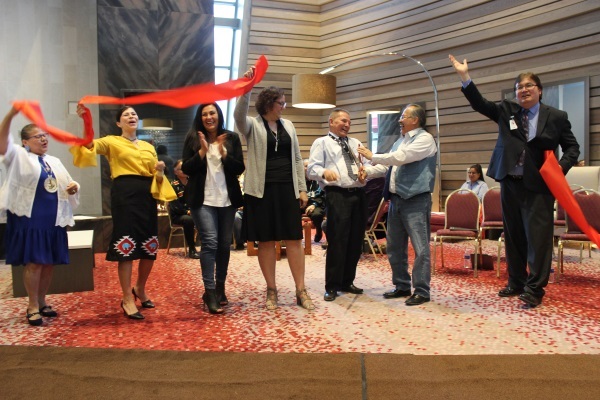 A re-grand opening celebration took place at the Ho-Chunk Gaming – Wisconsin Dells facility on Friday, May 11, marking the official end of the Project Forward plan and the opening of the renovated casino and hotel. Approximately 100 people were present for the ceremony. Senior Manager of Public Relations David Abangan was the emcee for the ribbon-cutting ceremony, with speakers Chief Clayton Winneshiek, Senior Marketing Manager Beth Anacker, President Wilfrid Cleveland, District II Rep. Kristin WhiteEagle, District III Rep. Kathy DeCamp, Business Executive Director Robert Mudd, elder Paul Cloud, and HCG-WD Casey Fitzpatrick. Also speaking were Wisconsin Department of Tourism Deputy Secretary Sarah Klavas, Miron Construction Vice President Tim Kippenham, and Hnedak Bobo Group (architect) senior associate Shawn Hobbs. After the speakers concluded their speeches, a cutting of the ribbon took place to symbolize the official re-opening of the facility. DeCamp shared a timeline with the audience, remembering when the Ho-Chunk Nation began its business enterprises with a smoke shop in 1981, then progressed to a bingo hall with 23 slot machines. The first full casino was opened on Jan. 19, 1993, she said. Elder Paul Cloud spoke at the ceremony, telling the story of how his family donated the land to the Ho-Chunk Nation to be developed into the present gaming and hotel facility. The burial place is not far from the casino and hotel, he said. “The spirit of Chief Yellowthunder is still here,” Cloud said. His father was a deer hunter and dancer, a leader in the Native American Church, and a construction worker. He initially wanted to buy the land, but he was turned down by financial institutions. Finally, his funding came through, but soon he was unable to pay the property taxes because he had no income. The Winnebago Committee decided to help him out by paying his taxes and, in return, Cloud sold the land to the Ho-Chunk (known as Winnebago at the time) for $1. “That opened up the doorstep to the future,” Cloud said. He remembers one this his father said about the land and the Ho-Chunk people. “He hit his ground on the ground and said, ‘This is going to be a gold mine someday,’” Cloud said. Architect Shawn Hobbs said the redesign of the facility is representative of the unique and beautiful natural geography of the area, including the blue sky, the clear waters, the unique rock formations and the rich green vegetation of the land. The walls were inspired by the horizontal layers of the bluffs in the area. “The rich, valuable parameters of the design include all of the above,” Hobbs said. Abangan concluded by thanking everyone and providing an itinerary of events for the weekend in celebration of the re-opening. He said it was ironic that fireworks were planned for that evening and that it was raining, with forecasts of continued rain throughout the night, when the weather was perfect the day before and will be the day after.